Vinegar can be found in nearly every cupboard in every town in every country around the world. For over 10,000 years, humans have found inspiring uses for it – from healing elixirs, to pickling, to cleaning, to dissolving chewing gum, to preserving fruit. Vinegar was most likely created by accident by some sad sap who neglected a cask of wine out behind the local pub, only to find upon his return that it had turned sour (the French word for it is “vinaigre,” which, directly translated, means “sour wine”). 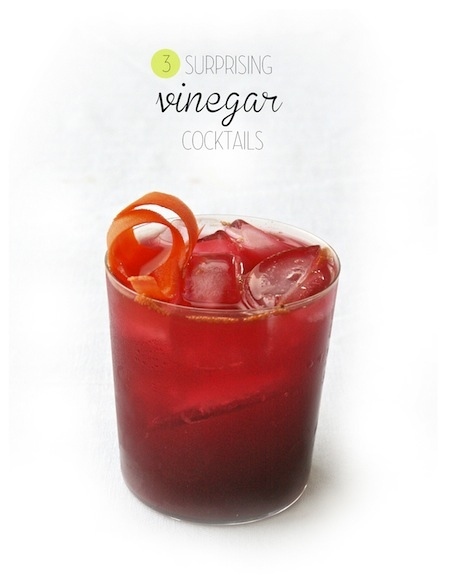 And thus, like so many other happy accidents in the beverage world, vinegar was born. At its root, it’s quite a simple process to make vinegar: The fermentation of natural sugars to alcohol is followed by a secondary fermentation to vinegar. In a world without refrigeration, like that of colonial America, spoilage was a constant enemy. Vinegar created a veritable Fountain of Youth for fruits. Shrubs – beverages made with fruit, sugar and vinegar – and vinegar-fruit syrups came into use. And today, after nearly being lost to time by the advent of refrigeration and industrially processed foods, shrubs and drinking vinegars are roaring back into fashion for the making of cocktails. Driven by progressive bartenders on the hunt for new flavors to add to their liquid arsenals, as well as the current lime shortage that’s hit the United States, the trend – which arguably began nearly 10 years ago – is now reaching a feverish pitch. Vinegar-based cocktails and nonalcoholic drinks can now be found in mainstream bars and restaurants around the country.